The Second Judicial District Commission on Judicial Performance, on a vote of 10-0, recommends that Judge J. Eric Elliff BE RETAINED. The governor appointed Judge Elliff to the Denver District Court bench in January 2011. Prior to his appointment, Judge Elliff was in private practice in Denver. 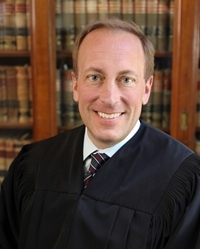 Judge Elliff earned his undergraduate degree at Washington University in 1984 and his law degree from University of Colorado in 1987. Judge Elliff also teaches Advanced Trial Advocacy as an adjunct professor at the University of Colorado School of Law. His community service includes participation on the University of Colorado Law Alumni Board, presenting Continuing Legal Education classes, and judging high school mock trial events. During the current term, Judge Elliff presided over domestic relations court for one year, civil court for two years, and criminal court since January 2014. The Commission reviewed survey results of attorneys, appellate court judges, and non-attorneys and three of Judge Elliff’s written opinions. Selected members of the Commission observed Judge Elliff in court. The Commission then interviewed Judge Elliff. Of the attorneys surveyed, 93% recommended retention (far exceeding the average of 80% for all district court judges), 4% recommended against retention (well below the average of 11% for all district court judges), and 2% expressed no opinion. Of the non-attorneys surveyed, 95% recommended retention, just 2% recommended he not be retained, and 3% expressed no opinion. Analysis of all the data supports retention. In the surveys of attorney and non-attorneys, Judge Elliff received an overall combined average rating that exceeded the average combined rating of all district court judges standing for retention, although the Commission notes that the sample size was relatively small. The written comments offer further support for the recommendation to retain Judge Elliff. His reported strengths far outweighed and outnumbered weaknesses. Attorneys described Judge Elliff as prepared, courteous, “extraordinarily competent and highly intelligent with great courtroom demeanor,” “smart and diligent,” and “fair, neutral, knowledgeable and primarily interested in coming to a fair resolution of a dispute.” Non-attorneys had similar feedback: “intelligent, organized, thoughtful, fair, impartial, unbiased and a consummate professional” and “treating all with dignity and respect,” and “polite, clear, fair.” Commissioner observations of Judge Elliff’s courtroom mirrored the survey responses. The reviews of his written work demonstrate a thoughtful judge who knows the law and writes well.